On a quiet street in Kentwood, the bleating sounds of goats and a crowing rooster are a familiar neighborhood refrain. 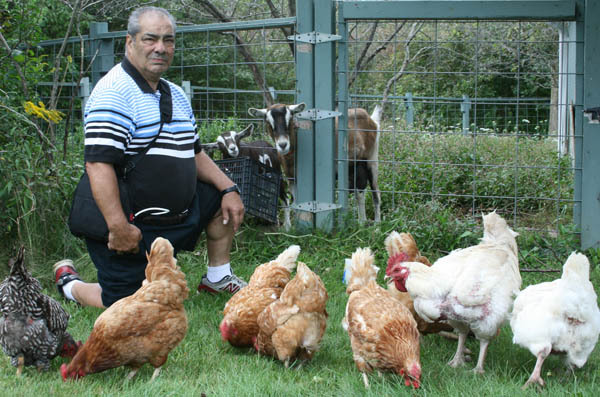 They're sweet music to the ears of Geno Lombardo, who tends to two goats, seven chickens and a rooster on his property. A retired pizza restaurateur, he fashions ricotta and Romano cheese from the goats' milk and gathers brown eggs each day from the chickens. What he and his wife, Mary, don't eat they give away to friends, neighbors and family. “I love it. It's in my blood,” Lombardo said. His land sits at the end of a cul-de-sac with a woodsy buffer on one side, but on a street with about a dozen houses. His tiny “farm” is within legal limits in this Grand Rapids suburb, and none of the neighbors seem to mind. “I got a neighbor who told me, 'We have to have the window open in the morning so my wife can hear the rooster crow. We love the rooster,'” Lombardo said. But urban-farmer relations aren’t always so harmonious, and the tension between upstart farmers and bewildered city officials is increasingly playing out before zoning appeals boards and courtrooms in Michigan, with first-time urban farmers seeking many of the same commercial protections afforded rural farming operations. The conflicts underscore how the scope and very definition of farming is evolving in an era of main street farmers markets and farm-to-table sourcing of food ingredients. Last year, Sky and David Brown bought an abandoned home on Detroit’s northwest side, on a block with other neglected houses and weedy vacant lots. While they rehabbed the structure, they said it only seemed natural to try their hand at managing a small menagerie – six chickens and three pygmy goats. It didn’t end well. Not long after, animal control officers came to their property and seized the animals, citing a city ordinance against keeping livestock in the city. In Muskegon, officials spent two years in court fighting a local resident who wanted to establish a commercial farm in a residential neighborhood where he kept five goats. The resident, Josh EldenBrady, claimed the city's objection violated his “equal-protection” rights under the U.S. Constitution. The city won, but not before racking up $40,000 in legal costs. A recent finding by a state advisory commission put the ball in the court of local officials, like those in Detroit and Muskegon, by recommending that they be given broad discretion on whether to approve farm ventures in residential areas. At issue is the scope of the Michigan Right to Farm Act, passed in 1981, when notions like urban farming, sustainable agriculture and community gardens were decidedly less mainstream. The act was intended to protect commercial farmers from lawsuits brought by new residents to rural areas who objected to conditions typical to farming, like odor and dust. But the law’s backers never really contemplated the reverse – that people in established residential areas would wish to start their own small-scale livestock operations, typically involving backyard chickens or goats. While urban farming makes up just a sliver of the state's $13 billion annual crop and livestock production, Michigan courts are rife with fights over just how and what operations cities can regulate. In April 2014, the Michigan Commission of Agriculture and Rural Development, which issues voluntary guidelines for farming practice under the act, decided that properties with livestock in primarily residential areas – with more than 13 non-farm residences within one-eighth mile of a proposed livestock location - did not fall under the act's provisions. It would be left to local units of government to decide whether to allow livestock under those circumstances. Decisions have varied from one town to the next. After a five-year battle, Grand Rapids officials decided this year that residents can keep chickens if no neighbor objected. Voters in the Ottawa County city of Ferrysburg will vote in November whether to allow residents with an acre of land or more to keep goats, chickens and rabbits. Residents opposed to the measure gathered petitions forcing the vote after the city council approved such operations earlier this year. In places like Detroit, with vast tracts of blighted residential land some would like to use for livestock, some advocates say it's time to view urban agriculture through a different lens than a tradition rural landscape. As these developments unfold, the Michigan Small Farm Council, which supports small farmers in urban, suburban, as well as rural settings, argues commission’s change in guidelines on the Right to Farm Act undermines the right of individuals to farm, regardless of where they live. Michigan Sierra Club Chapter Director Gail Philbin said she believes the agriculture commission missed a key opportunity to get behind a positive urban trend ‒ producing local, sustainable food in lieu of lieu of corporate “factory” farm operations. More broadly, Philbin sees the Right to Farm Act as unfairly tilted toward the interests of corporate agriculture. “Why are they a special class?” she asked. But a Michigan State University expert on urban agriculture and the Right to Farm Act said he sees the commission’s decision as a potential clarifying step forward, one that could actually lead to more urban farming. According to Kurt Schindler of the MSU's Extension program, it makes sense to put regulation of agriculture in residential areas in local hands, since no single state standard could fit every circumstance. Schindler said municipal attempts to regulate agriculture have been muddied by conflicting court rulings on what local officials can legally allow, leaving the law unsettled. That makes it tough for local officials to know how to proceed. In some cases, Schindler said, courts have found municipalities have the right to prohibit certain farm activities in residential areas under authority of their zoning code. In 2013, a state Court of Appeals ruling denied an Ottawa County farmer the right to access his farm from a residential street. The court found that the Right to Farm Act was intended to be used “as a shield” to protect farmers from neighbors’ nuisance lawsuits, not “as a sword” to force local governments to take action to accommodate a farmer. Ten years earlier, a state Court of Appeals panel found in favor of an Oceana County ranch operation on 80 acres of land within a residential section of the Village of Rothbury. The court concluded the ranch had the right to operate, finding that its horseback riding and corn maze qualify as farm products and thus earned protection under the Right to Farm Act. “Those decisions have gone both ways,” Schindler said. Ultimately, experts say, the state’s courts, and not the agricultural commission, will have the final say on the exact contours of the Right to Farm Act. Schindler, of MSU, said it's likely some local governments will still reject requests to raise livestock in residential areas, while others may be open to it. Still others who may have rejected such requests in the past may be more inclined to approve them because they now feel they have been given authority to make such decisions. “This is a necessary step so we can accommodate urban agriculture,” he said. The Farm Bureau noted the state Department of Agriculture and Rural Development was also responding to the rise, and particular needs, of urban farmers by creating a work group to make recommendations on urban agriculture. That group issued a report in March calling for the creation of an Urban Agriculture Act, though still leaving zoning control in the hands of local government. In the meantime, Detroit continues to grapple with conflicts that seem inevitable in a city with an estimated 30,000 acres of vacant land. Last year, Mark Spitznagel, founder of a $6 billion hedge fund, brought a herd of 18 goats to the Brightmoor neighborhood of Detroit with plans to turn them loose on the brush and weeds overtaking the area’s vacant lots. “If you're looking for a definition of an ideal diet for a goat, that's pretty much it,” Spitznagel said. Turns out, a hedge fund manager’s goats received no more privilege than the pygmy goats belonging to the Browns. A few days after the goats appeared, animal control officers seized those animals, too. Kathryn Underwood, a planner for the City of Detroit, said the city is planning to send a proposal to city council next year that would allow livestock in residential neighborhoods under certain conditions. The problem, Underwood said, is writing a standard that would make sense for Detroit’s vast stretches of empty or abandoned neighborhoods as well as those neighborhoods with intact, stable homes. “This is a lot more complicated than people think,” she said. Less controversial was the city's decision in 2013 to legalize urban gardens and farms, so residents could grow and sell produce on sections of vacant land throughout the city. It formalized a movement underway for years as the city's population plummeted and empty land grew, making Detroit perhaps the nation's center for urban crop agriculture. But that measure did not address livestock. It's possible, Underwood said, the city will devise a standard to allow more livestock in neighborhoods with wide space between houses and fewer livestock in densely settled neighborhoods. As of now, the most likely livestock allowed would be chickens, rabbits, goats and bees. And there is no shortage of debate in the city. Perhaps we should make it legal to raise poultry and feed animals everywhere in Michigan unless local zoning addresses the issue. We will force local governments to have open discussion. Blanket exclusion would not be allowed. Think how much healthier we would be from the food and the activity of raising animals and planting gardens. Meanwhile, thriving cities on the West coast, namely Seattle, Portland, and San Francisco have embraced urban farms and have gone so much as to enlist urban goat herders to maintain empty lots and green spaces. This has two major benefits: 1) no pollution. A well maintained goat herd has no smell and makes far less noise than gas-powered equipment. and 2) the manure from goats and chickens is composted and worked into the soil creating an organic, sustainable enrichment. Win-win for these cities and their inhabitants on just about every front. No one is complaining about any of these cities being unlivable. Once again, Michigan struggles to keep up -- and loses its talented millennials to these places that "get it". Michigan is neither ahead of nor behind anyone. Both proponents for and opponents of can spout volumes of their virtue, but at the end of the day it by right is a decision for those who are most affected, this being the NEIGHBORHOOD. Something new for the neighborhood? Whatever it may be, let the neighborhood decide by it's consensus and not by outside interference. It's known as LOCAL CONTROL. There are humane collars that allow roosters to crow a lot more quietly - No Crow Rooster Collars. People are using them all over the world. The city of Nantucket is even working on incorporating them into their zoning ordinances. I work with the City of Kentwood and enjoyed the article. I just wish the writer would have reported that Mr. Lombardo went through a zoning process to secure approval of the chickens beforehand. Whats the difference between a goat or chickens or whatever. Than dogs that barks all the time and crap all over. Or cats that get into garbage and scream when there fighting and mating. It should be based on the weight of animals compared to how much property you have. This would eliminate the discrimination that people with non traditional pets face everyday. This is what I have been saying all along- there are chain dogs in our community who live every day outdoors and can be smelled down the block, but it is not the type of animal that is the problem, it is the actions of the owners who refuse to take care of them in a way that is species appropriate and mindful of neighbours. A size per space regulation would deal with traditional and nontraditional pets alike. Detroit is the most blighted city in the United States. The Rust Belt had continued to deteriorate while industry moves their manufacturing overseas. There is a stark contrast while the rich neighborhoods are gated, employ private security, and have street lamps. Where urban farming provides foods, industry, and activities for youth. Michigan's discriminatory application of the Right to Farm Act serves as stark reminder of where the poor stand in this country. First unfavorable laws move employment opportunities over seas, and now only corporations are allowed to grow food. This is not about chickens and goats. This is about The People's Right to Life, Liberty, and the pursuit of Happiness. Michigan obviously favors death, repression, and misery. Please let's move on opening the city of Detroit to chickens and goats! Affluent suburbs in Atlanta put goats to work to clear lots. Why can't we apply a reasonable standard here? Chickens would help provide fresh eggs to places that suffer from the food desert that is urban living. It just ekes good sense. Don't forget bees in the equation either. Urban farming is a nice idea but it comes with a price. Having a few chickens for eggs is one thing, but having a menagerie of animals can lead to problems unless the owner is truly responsible and meets all USDA as well as state standards. Too many people like the idea of having a goat, a pig, dozens of chickens, etc. and then find the cost of taking care of them including feeding, vet bills and cleaning up after this is more work than what they anticipated so the animals end up either being ignored or becoming a health issue. I know because I've seen it happen. Its like buying a bunny for your kid at Easter. Once the cuteness wears off the bunny becomes a problem gets ignored, released into the wild where it won't survive or ends up dead. No neighbor wants to see this out their kitchen window, nor do they want to deal with animals that are not properly taken care of. If urban farming with animals is allowed I would insist that all owners be visited, unannounced, each year by the USDA or state agriculture agent to make sure things are clean and he animals are considered healthy. The technology is here, The common sense is LOST !!! Zoning laws were initially introduced to protect health, safety and welfare of persons living in tenements in New York City. They have progressed (actually regressed) grossly out of control since then. Why not simply deal with any health, safety or welfare issues, regardless of the subject at hand, and otherwise let people live their lives? (I would offer that a rooster crow in cities which already suffer from excessive noise, would not constitute a health, safety or welfare issue).